Writer’s Digest has announced that Bob Eckstein, whose latest book (shown to the left) has received great notices, will become their recurring columnist beginning this summer. Read all about it here. 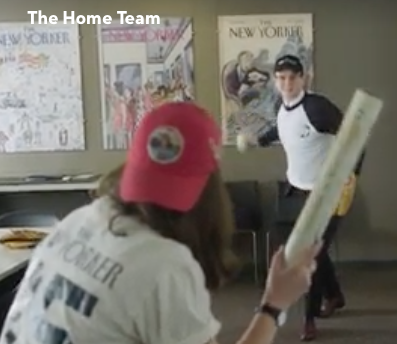 …In the latest episode of The Cartoon Lounge, The New Yorker‘s cartoon editor, Emma Allen plays ball with Colin Stokes, the associate cartoon editor. And they also take a look at Ed Steed’s full page (yes, a full page!) drawing appearing in the magazine’s latest issue. Nice glimpse of the Thurber wall drawing around the 2:05 mark. …also of note: Kim Warp is now doing the Daily Cartoon.